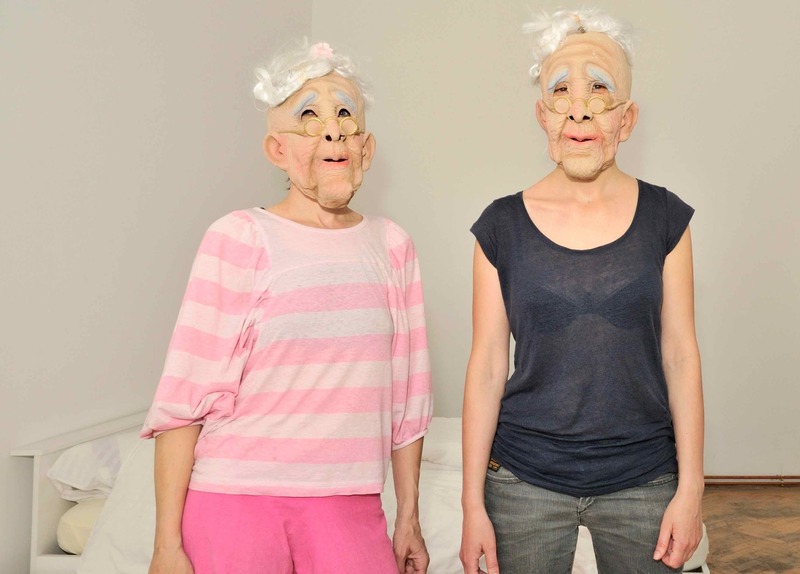 NEOZOON is an art collective founded in 2009 by a trio of female mask-wearing artists from Berlin and Paris. From repurposing discarded fur coats to reediting hunting and pet videos taken from YouTube, the group create visual media that interrogates society’s paradoxical relationship with non-human animals. NEOZOON’s objective is to expose the hypocrisy of our “celebration and simultaneous exploitation” of non-human animals (Knight). From their street art collage to their found-footage GIFs, NEOZOON recycle existing materials that are already laden with history and recontextualise them to produce new meaning. The collective is careful not to label themselves as animal rights activists, deeming the framework of laws surrounding animal rights to be restrictive, and preferring art as the best platform for encouraging critical thought. 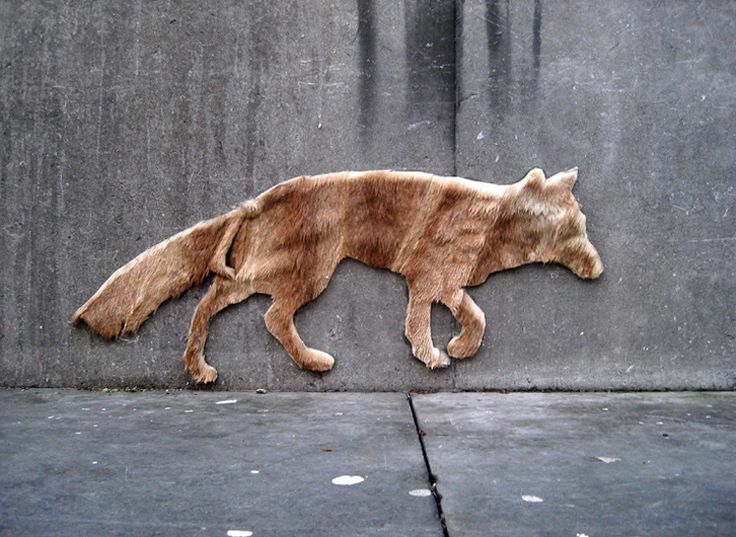 Their first work, Fur Coat Recycling (2009-12), is a series of installations that involve pasting discarded pelts in the shape of the animals they once belonged to on city walls. In Paris, the group fashioned fur coats to look like a flock of sheep charging towards Parc de la Villette, an area formerly home to the largest cluster of abattoirs in 19th century Europe (Knight). By bringing the remnants of dead farmyard animals into the urban space, the group not only force us to acknowledge that they were at one point alive but also make visible the invisible work of industrialised slaughter. “Neozoon” is a term to describe an animal that has been introduced through human intervention into a place in which it does not naturally belong. Using the symbolism of this term as an organising principle, NEOZOON’s oeuvre hints at John Berger’s contention that the human/non-human animal relationship has been significantly changed over the last two centuries (21). Berger traces the evolution of our relationship with animals, as they went from co-habiting kindred beasts that were “subjected and worshipped, bred and sacrificed”, to being either invisible or simply a “marginalised spectacle” for captive entertainment (emphasis in original, 16). In short, animals are now out of place in western society. NEOZOON’s film Fair Game (2011) explores this dialectic: on a city street, but set against the fake backdrop of an idealised German hillside, two well-equipped hunters play the hunting horn with numerous animal pelts at their feet; the wild gesticulations and wrinkled old-man masks pillory the ritual, which is absurd and out-of-place. The film takes a turn for the surreal when the hunters pull out cellophane wrapped meat products from a fur coat sewn into the shape of a boar. Tellingly, a supermarket poster selling meat is positioned in the rear of the frame, hinting at our estrangement from the process of killing animals for meat. NEOZOON have also looked to other visual media in which the image of the animal is abundant. Their found footage films use amateur home videos taken from YouTube, amongst other sources. The films expose power dynamics that would go unnoticed in the video’s original contexts by manipulating the footage through looping and repetition. In Unboxing Eden (2013) snippets of home footage of men unboxing snakes to add to their collection are edited together to make a longer narrative. The words “she’s pretty feisty” are repeated a number of times while the snakes hiss and lash out at their owners. The duplicated actions and phrases are cut together to show the imbalance of power between the animals and their captors. Tom Gunning describes the process of working with found footage as a “radical decontextualisation and redefinition”, wherein original meaning attached to the image is ‘loosened’ (167). For example, experimental filmmaker Martin Arnold’s films are made up of several seconds of archival film clips which he slows down, repeats, reverses and draws out into longer sequences. In his short film Piece Touché (1989), the repeated clip of a female character nervously moving her hands while a door in the background opens and closes reveals “latent symptomatic potentials” that symbolise her anxiety while she waits for a man to enter the room (Fraunberger). Similarly, in NEOZOON’s Shake, Shake, Shake (2016), the action of two big game hunters shaking hands over the body of an animal they have just shot and killed is multiplied and strung together in the form of a number of GIFs. The film’s repetition interrogates more conventional ‘trophy photography’ which, according to Garry Marvin, shows that “in death, the hunted animal belongs fully to the hunter” and their dominance over the animal is cemented by the ritual of the hunter having their photograph taken with them (25). With every subsequent GIF, the significance of the seemingly innocuous action is amplified until the handshakes turn into a bizarre display of masculine congratulatory twitchings. The film goes further: with the exception of a single black gamekeeper on the periphery of one of the clips, women and people of colour are excluded. In its entirety, the film serves as an intersectional critique that exposes unequal power relations between the white, male, Western hunter, the non-western other, and the hunted animal. NEOZOON’s Buck Fever (2012) also comments on this dynamic. In their book Zoopolis, Sue Donaldson and Will Kymlicka identify a paradox wherein society’s ‘othering’ of the animal kingdom manifests simultaneously in either their denigration as brutes or an elevation to a higher level of admiration (37, emphasis mine). It is precisely the animal’s difference that generates a “powerful aesthetic and moral responses of respect and awe”, particularly if they are “threatening or alienating” (Donaldson and Kymlicka 37). The contemporary hunter experiences both these feelings, the first to justify the killing of the animal and the second to celebrate it after its death. This is reflected in Buck Fever, a film that is composed of multiple YouTube hunting videos. The film depicts wild animals being hunted, shot, killed and finally admired by their hunters. As Marvin contends, trophy hunting is a practice that relies upon a level of difficulty in bringing about an encounter with the animal in order for pleasure and satisfaction to be derived from its death (19). The hunter cares less about obtaining the animal for meat or even killing the animal than the notion of having overcome the animal by committing “themselves intensely and fully to the visceral and emotional pleasures of hunting [with the animal finally] sacrificed to the pleasure of that passion” (Marvin 25). For Buck Fever, NEOZOON cut together shots so that the words “look at it” and “oh my God” are repeated in hushed tones amid bouts of heavy breathing. 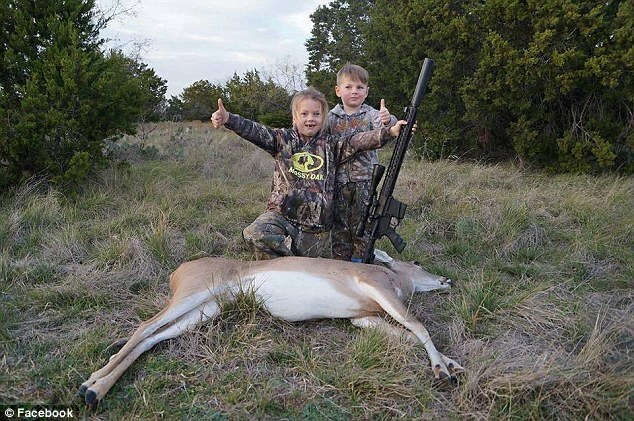 The hunters’ exhilaration comes from having successfully exerted control over the animal through its death and the film ends chillingly with a child’s words “I killed a deer!”. The presence of videos of pets, recorded by their owners and released online, acts as metonym for the paradoxical relationship between the simultaneous exploitation and celebration of animals. For Berger, the ‘unique’ innovation of pet keeping makes apparent the simultaneous desire to other animals, whilst “co-opting them into the family and into the spectacle” (24). Effectively held captive by their owners, the pet has its agency taken away from it, and stands as a cipher through which we measure our human properties. The companion animal can never fully integrate into the family due to “its lack of common language”, which “guarantees its distance, its distinctness, its exclusion, from and of man”, yet the pet is important to humanity, in its offering companionship to the “loneliness of man as a species” (14). In her paper The Companion Species Manifesto, Donna Haraway recognises pet keeping as the “implosion of nature and culture”, whereby cats, dogs and their owners are bonded by their otherness (18); the vast number of pet-related online videos reveal how owners make a spectacle of this otherness. Recognising the inherent contradiction of pet keeping, Neozoon has coordinated footage of pet owners disciplining their dogs in Good Boy, Bad Boy (2011). The film starts with dogs being made to do demeaning tricks; one dog is told to “play guitar” and another pushes a child’s stroller while standing on its hind-legs. What seems charming at first, quickly turns into a disturbing string of degrading performances endured by the pets. Shots of dogs being chastised for being incontinent are cut together with their owners’ demands to “look at me” and “say sorry”. Society places a special value on dogs different from that of wild animals, insofar as they are “attributed the capacity for ‘unconditional love’” (Haraway 33). However, this relationship is predicated on the animal’s dependency on humans and their inability to communicate with us on their own terms. Good Boy, Bad Boy exposes the farcical notion of demanding an animal “say sorry” and obey their owner’s every command, while at the same time adhering to a fantasy of co-community and unconditional love. NEOZOON appropriates audio-visual texts which circulate in the ethereal spaces of the internet’s digital archives and act as portholes through which the collective unconscious can be read. These texts are then reworked and formally interrogated to reveal how logics that are largely accepted as innocuous are evidence of society’s paradoxical exploitation and celebration of the animal. NEOZOON asks the troubling question: when is an animal a pet, when is it a piece of meat, and when are animals simply other sentient beings, who are similar and dissimilar to us and live their own, free lives? Berger, John. Why Look At Animals? London: Penguin, 2009. Print. Donaldson, Sue, and Will Kymlicka. Zoopolis. New York: Oxford University Press, 2014. Print. Fraunberger, Andreas. “Three Austrian Filmmakers. A Psychoanalytic View on Works of Kurt Kren, Peter Tscherkassky Aad Martin Arnold.” PsyArt. 31 Dec. 2008. Web. 9 Mar. 2017. Gunning, Tom. “From Fossils of Time to a Cinematic Genesis. Gustav Deutsch’s Film ist.” Gustav Deutsch. eds. Wilbirg Brainin-Donnenberg and Michael Loebenstein. New York: Columbia University Press, 2009. 163-180. Print. Haraway, Donna. The Companion Species Manifesto: Dogs, People, and Significant Otherness. Chicago: Prickly Paradigm Press, 2003. Print. Marvin, Garry. “Wild Killing: Contesting the Animal in Hunting.” Killing Animals. eds. The Animal Studies Group. Urbana and Chicago: University of Illinois, 2006. 10-29. Print. Knight, Nika. “NEOZOON And The Non-Toed Fur-Coaties.” PLANET. 25 May 2010. Web. 10 Mar. 2017. Rascaroli, Laura. “The Essay Film: Problems, Definitions, Textual Commitments.” Framework: The Journal of Cinema and Media, vol. 49, no. 2, 2008. pp. 24–47.